Super Smash Bros. Ultimate | Version 3.0 Out Now! Universal Gaming Gaming Galaxy Video-Games Super Smash Bros. Ultimate | Version 3.0 Out Now! Since this game is going to be at E3, may as well get the topic ready for all the stuff we'll find out. I hope they don't reveal everything like they did with 3DS/Wii U, just so there's some surprises in store for everyone. I'm still expecting it to be a definitive version of the 3DS/Wii U Smash with extra content added in and maybe some tweaks to things. I doubt they built this thing from the ground up. You know what? 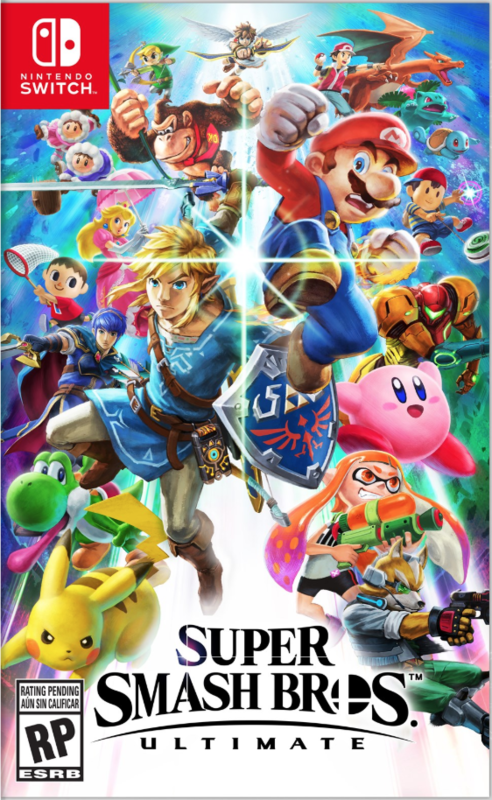 I honestly will probably pick this up cheap at one point, and I think it'll be cool to see all the character in there and hopefully the return of the Ice Climbers. Just I don't think it'll be a game I play much. I think it'll be more like an updated version of the Wii U and 3DS smash. If it was entirely built grounds up for the Switch I'm going to be really shocked. I'm on the fence if the Smash Bros. Switch is going to be an updated Smash 4, or an entirely new game. Really can't tell, but can imagine being either one. Even though Smash 4 came out four years ago, seems to lean towards a definitive version of that. Since 2008 Brawl it's a 6 year gap, and from the announcement it was assumed to be a '18 title. It is possible though, they've used Smash 4 as a base to start a new game. Support pretty much stopped after Bayonetta and Corrin, apart from some tweaks, which was....I forgot when. The wait however is finally over for tomorrow. Also the invitational, I REALLY want to see that live. Splatoon's Inklings are well deserved as newcomers. BoW Link pretty much was a must too. Nintendo finished off their E3 Direct with a smash, by unveiling all the details of the upcoming Super Smash Bros. game for Nintendo Switch. Super Smash Bros. for the Nintendo Switch will be called Super Smash Bros. Ultimate. Cappy is now part of his outfit, and he can also wear his Wedding and Builder outfits. Now wears his Champion's Tunic from Breath of the Wild. His bombs are remotely detonated, and his Final Smash unleashes Ancient Arrows. He can also wear Link's classic outfit too. Path of Radiance and Radiant Dawn outfits are choices for Ike. Both versions have slightly different voices. You can now play as Female Pikachu. His design is now based on Star Fox Zero, and his Final Smash has received an overhaul to make it faster. His Final Smash is a wilder version of Fox's. In one-on-one fights, Ryu will always face his opponents. Charge moves such as Samus' Charge Shot can now be powered up in mid-air, and can be cancelled with jump or dodge, but you'll be open to attack. Marth's Dancing Blade is faster now, and easier to unleash. This applies to Roy and Lucina too. Marth is also fully voiced in English now. His Final Smash is now a cage fight where he can unleash his missiles and a jet hammer. Its electric shock will still damage itself. Her appearance is based on A Link Between Worlds. Her Final Smash is a sealing move called Triforce of Wisdom. His Final Smash is now even faster! His Final Smash is also faster and loops around the stage. You are no longer penalised for sticking with a single Pokemon, so feel free to pick your main. You can also play as a female trainer for the first time. Some fighters such as Captain Falcon will trigger a dramatic slow motion effect on strong attacks in one-on-one fights. Both of his outfits from the previous Smash games are available, and his Limit Gauge is now always displayed on screen. You can now see how much longer Robin can use Levin Sword and Tomes. You can now see what Villager has pocketed above his damage indicator. There are eight different Villagers. Bowser's Final Smash, Giga Bowser, is now bigger and better. He's as big as Bowser from the Yoshi's Island game. His design is based on Star Fox Zero, and each of his moves has received a significant upgrade. He has the ability to copy every single fighter in the game, and a new object, the stone chest from Breath of the Wild, has been added to his Stone Ability. Switching Monado Arts can be done with a button press and quick directional input to choose the Monado Art you need on the fly. Fiora is also part of his Final Smash. He now has his appearance from Ocarina of Time, and he transforms into the Demon King Ganon for his Final Smash. Proportions have been altered slightly, and their move types have been enhanced. There are also 12 voice options available. He has a new Final Smash called The Lightning Chariot. She uses her Power Suit to fire a devastating laser from her gunship for her Final Smash. When he gets damaged, you'll briefly see a crack in his helmet. Her sound effects are different between costumes. His Final Smash, Wario-Man, no longer uses individual attacks to get the job done. His Final Smash is a flurry of rapid punches like Donkey Kong Jungle Beat. His Final Smash is now a rush of blows from Giga Mac. His new Final Smash features Paula and Poo. Likewise, Lucas' Final Smash features Kumatora and Boney. Her face has been redesigned. His Final Smash now includes Proto Man and Bass. Palutena's special attacks have been streamlined, and her down special is now a counter and a deflector. He now has a fuel gauge on his chassis to show how much longer he can use his jetpack. These characters are now Echo Fighters, and share the same moves as Marth, Pit, and Peach respectively. However their characteristics are different. Not changes due to being new, but inked opponents will take more damage. Inkling can also use different weapons as Smash Attacks or Special Attacks: Splatter Shot; Splat Bomb; Splat Roller; and the Final Smash, Killer Wail. You can run out of ink, so press B while shielding to refill it! There are eight different Inkling's all with their own outfit and ink colour. Squid Sisters - During their concert, the camera will zoom in towards them, shrinking the play area to make knockouts easier. In total there will be more than 50 Assist Trophies in the final game. A few new items were shown, including Bewear, Solgaleo, Healing Field, Black Hole, Fake Smash Ball, and Launch Star. More new Pokemon and items have yet to be revealed. All stages will have Battlefield and Omega versions. Their sizes and terrain are all the same, but their appearances and music will alter. You can use a Gamecube controller to play the game! All Super Smash Bros. amiibo figures are compatible with the game, as well as amiibo of those characters from other series. FP data from previous titles can be transferred into the game. Ridley and Daisy will be getting Smash amiibo. You can purchase Super Smash Bros. Ultimate on December 7th, 2018! Nintendo Switch's Smash Bros. has been confirmed to be a brand new game. A complete Smash Bros experience, as every character from past games in the series return, along with newcomers the Inklings, Daisy whom is an Echo Fighter of Peach, and Ridley. That's right, all from Melee and all guest characters, which includes Solid Snake. New and returning stages, new techniques for game play, new Assist Trophies, all amiibos will be compatible, and more. Check the video above for all information revealed for E3. Super Smash Bros. Ultimate will be releasing December 7th, 2018. And now for my toned down reaction. This game is going to be HUGE. Holy moly, I'm so happy to hear about every playable character in the series has returned. Charizard has reverted back to Pokémon Trainer. Ganondorf uses a freaking sword, and many characters can use alterations for special moves like Palutena. Three Links, two Marios, I don't care. Ice Climbers, Wolf, Pichu and Snake are back. Totally awesome! I need this game! EDIT: Moony, you posted before me, and you're posting everything. OK.
Don't forget the most requested character actually made it into this new Smash Bro's title. I will put this into the post I'm working on, but Ridley and Daisy will be getting Smash Amiibo's at some point. I don't think they gave a date for them but I may have missed it. I mentioned Ridley and Daisy in my first part of the post (not the amiibo bit). Awesome both of them made it into this game, along with Inklings of course. Funny, Daisy Ridley. Waiting on the Invitational now. Saw bits of the Treehouse segment on Smash Bros. Ultimate. During Sudden Death, flames appear around the screen and slowly zooms in, the longer the SD takes. I'm assuming anyone touched by flames are instantly K.O. 'd regardless of being hit into them or not. I'm so happy they're using that awesome art piece they showed during the Direct! I was hoping they'd use a version of that wide spread image depicting the characters, too. Worthy box art. I hope the inside cover is the wide version of the art as that'd be a cool place to put it. Also, Snake's original voice actor will be returning to voice Snake in this game. Um..........this looks like an enhanced & remastered WiiU port. It's pretty & full of new pretty characters, along with a fan favorite request getting finally filled.. I just don't know if I'm interested tbh. Maybe more will be shown before this drops & it'll change my mind. But at the moment, I'm leaning on a no for this in favor of the Shonen Jump cross over Brawler. " Glad Snake's got his original VA.
Not sure if it was his original VA in Brawl and 4, but Ike's has changed when they demonstrated the two voices of his. I definitely preferred how he sounded in the two games previous, even if it was a bit weird his voice didn't change slightly for his Radiant Dawn model in 4. Voice suited him better. Unless it's a stand in for something else, but I doubt it. Ike was a character I played in Brawl and 3DS, so that bothers me a bit. Eh. There were other voices transitioning between games I haven't like before which don't bother me anymore, so I'll probably get over it anyway. Remember it now, that Smash Attacks are used by pressing A and B. Hmm. Don't know about that one, don't like the idea. Perhaps it's so Joy Cons can be implemented, so other controllers with more buttons...*remembers Controller options in Smash 4* OK, maybe we can change that for preferences. Anyone wanting to find out a bit more about each character, all Fighters are up on the SSBU official site with a short video and images for each one. May see new things, like what stages and new moves. Dr. Mario now has a spike kick for his down aerial move, and Ganondorf uses a sword for Smash Attacks. I know Mario's character video features a scene of New Donk City from Odyssey, which would be neat to get a stage for. What I'm most interested in seeing now is news about the single player side of the game. Will it be a campaign, or something similar to the 3DS version? I'd like it if Smash Run came back as a mode because that was super fun. I haven't actually played a smash bros game since Brawl, but I do have the switch, so I could get this in the future.